(Commemorating 2018, here is an account of one of my year’s highlights from October). 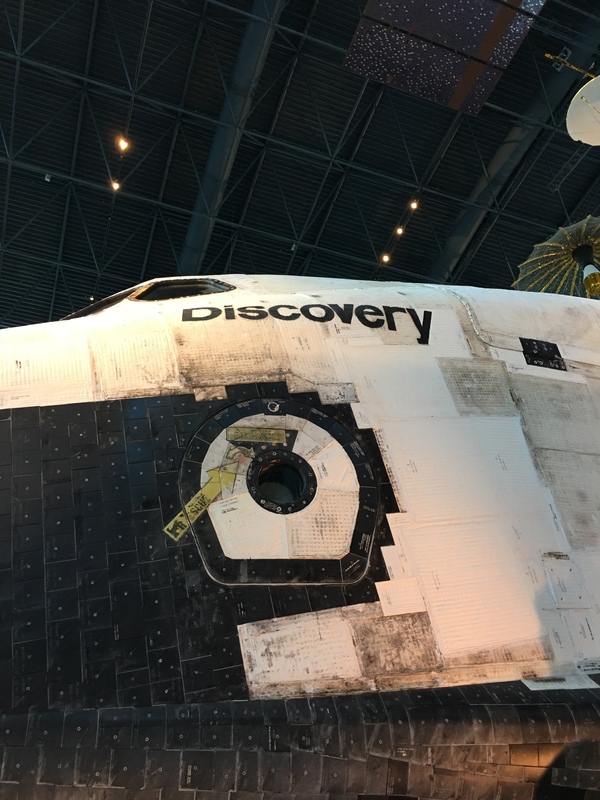 Given that it used to take only 8.5 minutes for the Space Shuttle to get into orbit, it was a bit rough that it took me 2.5 hours on public transport to reach the Udvar-Hazy Air and Space Museum, outside of DC. If you look closely in the centre of this image you can see the Space Shuttle Discovery through the door of its own hall. This was a particular pilgrimage for me. I had gone specifically to have my first ever close encounter with a Space Shuttle — Discovery. The Space Shuttle played a huge part in my childhood. I got autographs of shuttle astronauts and kept track of all the developments in the shuttle program. I remember running to a friend’s house at lunchtime to watch live launches of Columbia (when the tank was still white), and holding my breath as we waited to hear the radio signal that confirmed the Shuttle had survived re-entry. (The disintegration of Columbia on re-entry in 2003 that killed 7 astronauts was the cruel reminder that it was anything but routine). The Space shuttle Discovery was moved to DC after its retirement in 2011 and is now housed in the Air and Space Museum near Dulles Airport (the more famous Air and Space Museum is in town on the Mall). It is in good company in this location. A full-size concord. The actual Enola Gay, the plane that dropped the first bomb on Hiroshima. A very sleek looking Lockheed Blackbird. The smallest bi-plane ever to fly (I had to add that, it looks so cute, and unlikely). Sitting next to these other aircraft, you see just how much of a flying brick the shuttle was. Like Tom Cruise, it is smaller in real life than on the screen. By comparison to real aircraft, its wings seem disproportionately small, and its demeanour a little stocky. But with its black and white panda colours and cute little puppy nose (combined with a deep sense of familiarity) it is a thoroughly friendly looking craft. Discovery has a particular resonance for me. It launched the Hubble Space Telescope in 1990. In 1991 it launched the Upper Atmosphere Research Satellite (an acronym that has always made me laugh), data from which I analysed in my PhD thesis. Piers Sellers, the Edinburgh University alumnus and genuinely nice guy (who sadly died of pancreatic cancer in 2016 – I’ve posted about him before) flew on it. And Discovery also has a Scottish connection as it is named after a series of exploration of vessels, one of which is now in Dundee (hence, the “City of Discovery”). Dundee is where I first started to specialise in Earth observation when I did my masters there in 1989. So, it was particularly fitting that this was the first shuttle I met face-to-face. It is a remarkable machine. The fantasy of the 1970s was that the space shuttle would be the first spaceplane. While it never quite reached the point of being routine, this vessel did revisit space 38 times. One has to admit that it’s rather quaint tatty appearance does convey a sense of it being a workhorse, rather than some flashy perfect sci-fi spaceship. (The pattern of tiles close up reminded me of the Sydney Opera House, which is also covered in a tight pattern of close-fitting tiles). And I found it remarkable just how rugged was its appearance. You could see replacement tiles and patches, and you can see the striations caused by the heat of the re-entry, across the tiles. I guess its the same for anyone who meets their hero in real life — they are a bit smaller, a bit older, and a little bit more creased in real life than you might have imaged, but their familiarity and approachability makes the encounter memorable (and well worth the 2.5 hours on trains and buses). Postscript: I returned to my hotel in 60 mins via Uber. Gerald, the driver, was originally from Ghana. We discussed Ghana, peanut soup and rice balls, forests, Chinese exploitation of Africa, Uber, Lyft, data science and big data, python and R, pharmacy and antibiotics, and 3 ideas for new businesses he is going to start in Ghana. We are now connected on Linkedin.